A gorgeous setting; the roar of the ocean waves, the colors of sunset, privacy, a perfect vacation in Paradise. The Waterfront Cottage on Providence Point is one of the most beautiful settings in the Virgin Islands. 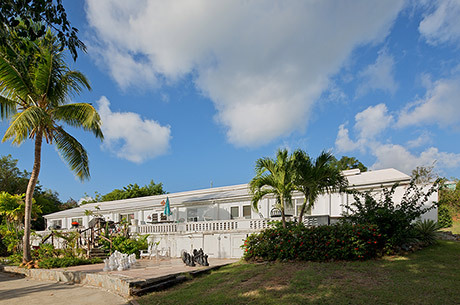 Providence Point is a privately owned peninsula on Water Island, USVI Water Island is only a five-minute ferry ride away from St. Thomas, however it will seem as though you are a million miles away. Quiet, peaceful, beautiful Water Island awaits you and The Waterfront Cottage gives you access to all of its wonder. Providence Point is singularly spectacular. 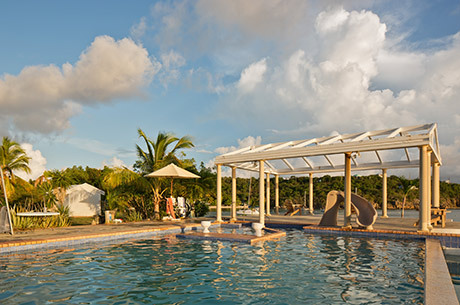 With the Caribbean Sea surrounding the point it will seem like you are on a private island. Private dock, a small private beach, close access to beautiful Honeymoon Beach, a private pool... It is simply magnificent. In this paradise there will be no neighbors, no interruptions, just you and relaxation. Although private you are not isolated, the owners are on location and can assist you. Read more about the Waterfront Cottage. Pool Overlooking Honeymoon Beach, Water Island.